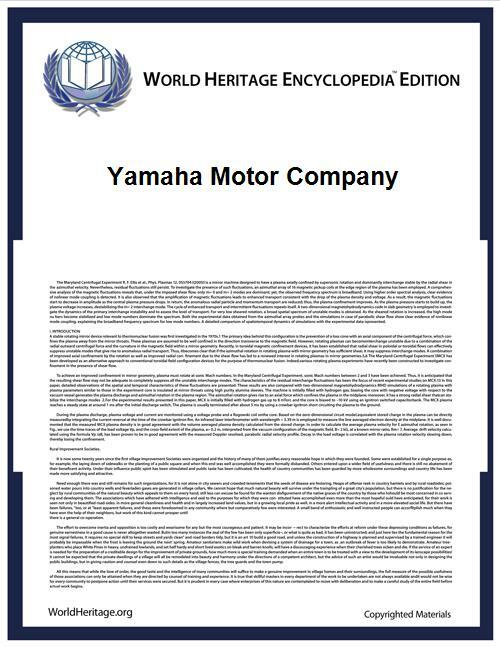 Yamaha Motor Company Limited (ヤマハ発動機株式会社, Yamaha Hatsudōki Kabushiki-gaisha) is a Japanese manufacturer of motorcycles, marine products such as boats and outboard motors, and other motorized products. The company was established in 1955 upon separation from Yamaha Corporation, and is headquartered in Iwata, Shizuoka, Japan. The company conducts development, production and marketing operations through 109 consolidated subsidiaries as of 2012. The company's products includes motorcycles, scooters, motorized bicycles, boats, sail boats, personal water craft, swimming pools, utility boats, fishing boats, outboard motors, 4-wheel ATVs, recreational off-road vehicles, go-kart engines, golf carts, multi-purpose engines, electrical generators, water pumps, snowmobiles, small snow throwers, automobile engines, surface mounters, intelligent machinery, industrial-use unmanned helicopters, electrical power units for wheelchairs and helmets. The company is also involved in the import and sales of various types of products, development of tourist businesses and management of leisure, recreational facilities and related services. The motorcycle division of Yamaha was founded in 1955, and was headed by Genichi Kawakami. Yamaha's initial product was a 125cc two-cycle, single cylinder motorcycle, the YA-1, which was a copy of the German DKW RT125. The YA-1 was a competitive success at racing from the beginning, winning not only the 125cc class in the Mt. Fuji Ascent, but also sweeping the podium with first, second and third place in the All Japan Autobike Endurance Road Race that same year. Early success in racing set the tone for Yamaha, as competition in many varieties of motorcycle racing has been a key endeavor of the company throughout its history, often fueled by a strong rivalry with Honda and other Japanese manufacturers. By 1963 Yamaha's dedication to both the two-stroke engine and racing paid off with their first victory in international competition, at the Belgium GP, where the won the 250cc class. Success in sales was even more impressive, and Yamaha set up the first of its international subsidiaries in this period beginning with Thailand in 1964, the Netherlands in 1968. 1965 saw the release of a 305cc two-stroke twin, the flagship of the companies lineup. It featured a separate oil supply which directly injected oil into the gasoline prior to combustion (traditionally riders had to pre-mix oil into gasoline together before filling the gas tank on two stroke engines). In 1967 a larger new larger displacement model was added to the range, the 350cc two stroke twin R=1. By 1980 the combination of consumer preference and environmental regulation made four strokes increasingly popular. Suzuki ended production of their GT two stroke series, including the flagship water-cooled two-stroke 750cc GT-750 in 1977. Kawasaki, who had considerable success throughout the 1970s with their two-stroke triples of 250cc, 350cc, 500cc and 750cc ended production of road-going two strokes in 1980. Yamaha bucked this trend and continued to refine and sell two-strokes for the street into the 1980s. These bikes were performance oriented, water-cooled twin cylinder machines, designed achieve excellent performance taking advantage of the lower weight of two strokes. The RZ-250 of 1980 was the progenitor of this series. The RZ-350, the largest displacement model, was a popular hot-rod bike of the 1980s and continued to be sold in some countries into the early 1990s. Yamaha has built engines for other manufacturers' vehicles beginning with the development and production of the Toyota 2000GT (1967) with the Toyota Motor Corporation. Also, the cylinder head from the Toyota 4A-GE engine was developed by Yamaha Motor Corporation and was built at Toyota's Shimayama plant alongside the 4A and 2A engines. All performance-oriented cylinder heads on Toyota/Lexus engines were designed and/or built by Yamaha. Some examples are the 1LR-GUE engine found on the 2010–2012 Lexus LFA, the 2UR-GSE found in Lexus ISF, the 3S-GTE engine found on the Toyota Celica GT4 and the 2ZZ-GE engine found on the 1999–2006 Toyota Celica GT-S. In 1984, executives of the Yamaha Motor Corporation signed a contract with the Ford Motor Company to develop, produce, and supply compact 60° 3.0 Liter DOHC V6 engines for transverse application for the 1989–'95 Ford Taurus SHO. 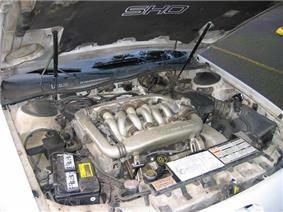 From 1993 to 1995, the SHO engine was produced in 3.0 and 3.2 Liter versions. Yamaha jointly designed the 3.4 Liter DOHC V-8 engine with Ford for the 1996–'99 SHO. Ford and Yamaha also developed the Zetec-SE branded 4-cylinder engines used in several Ford cars like the small sports car Ford Puma. Since 2005 Yamaha produces a 4.4 Liter V8 for Volvo. The B8444S engines are used in the XC90 and S80 models. British sportscar maker Noble also uses a bi-turbo version of the Volvo V8 in their M600. Yamaha also tunes engines for other manufacturers, such as Toyota, so Yamaha logos on Toyota S engines. 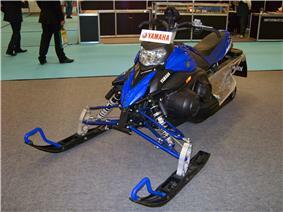 In 2010, Yamaha was the only snowmobile manufacturer to use four-stroke engines across its range. In Canada though, there are still three models that Yamaha manufactures that are still two-stroke. They are the Bravo, VK 540 and the Venture XL. Yamaha had introduced four-strokes to their line-up in 2003, and the line-up became four-stroke based for model year 2005. The RX-1, released in 2003, was the first performance-oriented four-stroke snowmobile on the market. It was not, however, the first modern four-stroke snowmobile produced. That honor belongs to Arctic Cat for their Yellowstone Special, released in 2000, which was designed as a rental sled that could meet Yellowstone National Park's stringent emission requirement. However, Yamaha received much criticism for its weight disadvantage when compared to similar two-strokes, despite its fuel economy and low-range torque. Yamaha is now using four-stroke technology with the introducing of their 80FI engine, which is equipped on the Phazer and Venture Lite models. This engine has one of the highest specific output of any four-stroke in production, with 160 HP/L, Yamaha achieves this even without the use of a forced induction system. Yamaha is also a key player in the "four-stroke wars", which are a series of advertisements from opponent Ski-Doo, who claim their E-tec and power-tec equipped two-strokes are still cleaner and more efficient than four-strokes, while Yamaha still claims the four-strokes are cleaner. Yamaha also broke a multi-year absence from sno-cross in the winter of 2006/2007 with their introduction of a factory race team headed by former Arctic Cat racer Robbie Malinoski. Yamaha was the first brand to win with a 4-stroke in a professional snowcross race. This happened in 2006 at the WPSA snow cross championship. ^ unattributed. "YAMAHA Motorcycles and Brand History". Autoevoluiton. com. SoftNews NET. Retrieved 15 January 2015. ^ "Yamaha Showroom Communication Plaza Collection". Yamaha Motors Website. Yamaha Motors. Retrieved 15 January 2015. ^ "Yamaha Collections: XS-1100". Yamaha Motors. Retrieved 16 January 2015. ^ Melling, Frank. "Memorable MC: 1974 Yamaha YZ250M Monoshock". MotorycleUSA.com. Motorcyle USA LLC. Retrieved 16 January 2015. ^ "Dakar Retrospective 1979–2007" (PDF). Retrieved 29 April 2011. ^ "Yamaha Motors Collection RZ-250". Yamaha Motors. Retrieved 16 January 2015. ^ "Yamaha Collection: RZV500R". Yamaha Motors. Retrieved 16 January 2015. ^ Vandenheuvel, Cornelis (1997). 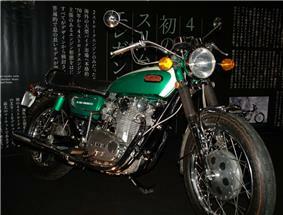 Pictorial history of Japanese motorcycles. MBI Publishing Company. pp. 84–90. ^ "Intelligent Machinery – Company information". Yamaha Motor. Retrieved 2011-12-27. ^ "SHO n Tell". Jon Mikelonis and Matt Wilder. Retrieved 2008-04-04. ^ Ford Motor Company (2007-07-19). 1989 Ford Taurus SHO commercial. Ford Motor Company. ^ "Toyota Twin Cam Article". Toysport.com. Retrieved 2009-07-14.